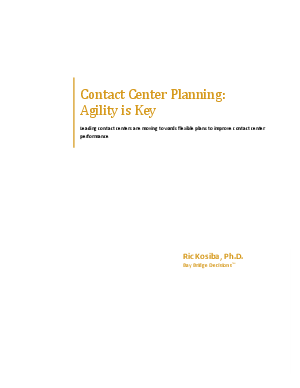 Leading contact centers are moving towards flexible plans to improve contact center performance. In times of significant business change, the financial plan and, for contact centers, the operational plan needs to also change and be changeable. The business planning process needs to be agile, and if possible proactive. Read this white paper to learn, in what terms, planning should be strategic and how it can be adaptive to suit the needs of your organization.